Anna Hazare has given an ultimatum to the Prime Minister Dr Manmohan Singh to enact stringent anti-corruption law– the peoples “Jan Lokpal Bill”! Jail to the corrupt must happen! We have been betrayed by those that are leading us! This is a defining moment for India that can give our children a better future! Let us unite and stand by him! Thousands will be there to support him. Come and stay with Anna at Jantar Mantar for a few days from 5th April. When & Where? 5th April at Jantar Mantar, New Delhi. Who is Anna Hazare? 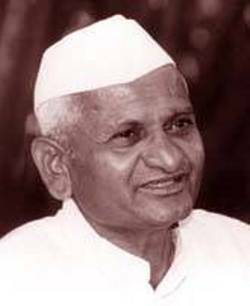 A soldier, lone survivor in his unit in 1965 Indo-Pak war, Anna dedicated his life to the well-being of society. A bachelor, an ascetic, he has no possessions, no bank balance and lives in a temple. In Maharashtra, Anna has single handedly transformed barren and dry regions into green and food surplus areas. He has fasted unto death on several earlier occasions. He forced the Maharashtra government to dismiss the corrupt - 6 ministers and 400 officers. Due to his fast, the govt enacted the Maharashtra RTI Act. In 2006, when government of India tried to amend the Central RTI Act, he again went on an indefinite fast and forced the Indian government not to amend RTI Act. Leaders, organizations and the common man from across India will be with him. This is a do or die moment – let us make it happen! Across India, join Swami Ramdev, Sri Sri Ravishankar, Swami Agnivesh, Arch Bishop of Delhi Vincent Concessao, Mahmood A Madani, Kiran Bedi, J M Lyngdoh, Shanti Bhushan, Prashant Bhushan, Arvind Kejriwal, Mufti Shamoom Qasmi, Mallika Sarabhai, Arun Bhatia, Sunita Godara, All India Bank Employees Federation, PAN IIT Alumni Association, Common Cause and many other prominent organizations and leaders, as India comes out on the streets! 100+ CITIES WILL RALLY BEHIND ANNA! When I sit on fast from 5 April, I urge my fellow countrymen to join me in fasting for one, two, three or whatever number of days you can comfortably fast. Along with fast, please pray to God (whoever you believe in) for better and corruption free India. Collective prayers from all the people of India would definitely have a huge impact. Write an impassioned plea to our Prime Minister that we look upon him to pass “Jan Lokpal Bill”, else we will be compelled not to vote for his party in next elections. Remain calm and peaceful and develop the courage to go to jail, if required, in this next freedom movement. Drafted by Justice Santosh Hegde, Prashant Bhushan and Arvind Kejriwal, this Bill has been refined on the basis of feedback received from public on website and after series of public consultations. It has also been vetted by and is supported by Shanti Bhushan, J M Lyngdoh, Kiran Bedi, Anna Hazare etc. It was sent to the PM and all CMs on 1st December. However, there is no response. 2. Like Supreme Court and Election Commission, they will be completely independent of the governments. No minister or bureaucrat will be able to influence their investigations. to jail within two years. 4. The loss that a corrupt person caused to the government will be recovered at the time of conviction. 5. How will it help a common citizen: If any work of any citizen is not done in prescribed time in any government office, Lokpal will impose financial penalty on guilty officers, which will be given as compensation to the complainant. 6. So, you could approach Lokpal if your ration card or passport or voter card is not being made or if police is not registering your case or any other work is not being done in prescribed time. Lokpal will have to get it done in a month’s time. You could also report any case of corruption to Lokpal like ration being siphoned off, poor quality roads been constructed or panchayat funds being siphoned off. Lokpal will have to complete its investigations in a year, trial will be over in next one year and the guilty will go to jail within two years. 7. But won’t the government appoint corrupt and weak people as Lokpal members? That won’t be possible because its members will be selected by judges, citizens and constitutional authorities and not by politicians, through a completely transparent and participatory process. 8. What if some officer in Lokpal becomes corrupt? The entire functioning of Lokpal/ Lokayukta will be completely transparent. Any complaint against any officer of Lokpal shall be investigated and the officer dismissed within two months. 9. What will happen to existing anti-corruption agencies? CVC, departmental vigilance and anti-corruption branch of CBI will be merged into Lokpal. Lokpal will have complete powers and machinery to independently investigate and prosecute any officer, judge or politician. JAN LOKPAL BILL will act as deterrent and instill fear against corruption (This movement is neither affiliated nor aligned to any political party) To stay updated about movement, either send a missed call at 02261550789 or send us your email ID. anna hajare is really doing very well. we are with him. Thanks for doing your bit to help the cause. There is a long way ahead. @Some unspoken words : what Anna hazare is doing is good, but to make that 100% foolproof is what we have to do. @Desi Baba There is indeed a long way ahead, this a start, meybe controversial, but it is, it is now on us how we take it ahead. He is a true fighter , and a man with pure soul , his words speaks out for him. And this initial victory is of great historic importance as it has paved way for the greater cause and in building a corruption free shining India again . Though still a lot need to be done. Nice informative post Sneha thanks. @Rachit: you have got a nice blog out there! , speak for people , speak for nation , share with us publish with us . you really had the news at that time itself...cool..